Solarcentury, a solar energy company specialized in solar panels and photovoltaic systems, is one step closer to finish the construction of London’s largest solar roof. When the project will be completed, it is also expected to become world’s largest solar bridge. 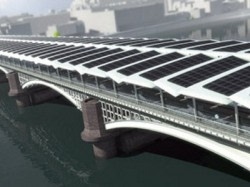 As the company claims, the solar roof will contain around 4,000 photovoltaic panels above a bridge spanning the River Thames (a part of the Blackfriars station), generating 900,000 kilowatt-hours of clean energy per year, enough juice to power 35 homes. Scheduled by the middle of 2012, the solar bridge will also get rid of more than 500 tons of CO2 emissions annually. The Blackfriars upgrade is part of Network Rail’s Thameslink program, intended to provide longer trains running on the Bedford to Brighton route through London. When the construction is completed, more than 24 trains per hour will travel through the central London section of the route. “We’re creating a spacious, modern station and delivering a vastly improved train service for passengers, while at the same time installing London’s largest solar array to make Blackfriars more environmentally-friendly and sustainable,” said Lindsay Vamplew, Network Rail’s project director for Blackfriars.